Richard Erskine Frere Leakey (born December 19, 1944) is a Kenyan politician, paleoanthropologist and conservationist. Protecting elephants and conserving natural ecosystems remain my personal priorities. But I am not so sure this would be so were I ill, hungry, and living in dispair. ...We must somehow find a way to provide for our own species if we are also to preserve others. I'm known for speaking my mind, a trait I probably inherited from my parents, Louis and Mary Leakey—neither of whom was renowned for tact. I think both Louis and I were looking for more or less the same thing, and that is, when did our species, Homo, begin? A vital leap in the evolution of intellectual capacity would have been the ability to form concepts, to conceive of individual objects as belonging to distinct classes, and thus do away with the almost intolerable burden of relating one experience to another. Concepts, moreover, can be manipulated and this is the root of abstract thought and of invention. The formation of concepts is also a necessary, but apparently not sufficient, condition for the emergence of language. Ever since Darwin tied knots between human beings and the rest of the animal world, many people have frantically attempted to untie them again, declaring that even though our roots are in the animal world we have left them so far behind as to make any comparisons utterly meaningless. To some extent this is true, because the quality that makes us unique in the biological kingdom is the enormous capacity to learn. The quality that accompanies the emergence of learning in the evolution of higher animals, namely intelligence, is surprisingly difficult to define. In its extreme form self-awareness manifests itself in notions such as that of the soul, but in simple form it merely means to be aware of oneself as an individual among others. It appears that the evolutionary process promotes its own progress: learning about the environment (which demands a certain intelligence) means living in a stable social mileau (which demands at least an equal and possibly a greater intelligence); as social intelligence increases, so too will the ability to learn; this in turn encourages an even longer social apprenticeship; and longer group living leads to more social intelligence. Prehistoric images speak to us more evocatively than any other element of the archeological record: colorful, vibrant paintings of horses, of bison, of a panoply of animals and humans that often seem alive and in motion. And yet there is a dimension of unreality about them... The images seem plucked from life... often arranged chaotically to our eye, frequently superimposed... sometimes apparently incomplete. ...There is an enigma in these images, a profound challenge to our understanding of the past. To our western eyes, the painted images are the most prominent component of a corpus of artistic expression. This Western bias, a particularly Eurocentric bias, has been pervasive and deep. ...it has resulted in a lack of attention to, and concern about, prehistoric art of equal and sometimes greater antiquity in eastern and southern Africa. Because the art of Africa was on rock shelters, not deep in caves, as in Europe, the ravages of time have eroded most of a rich expression. What we now see is the merest glimpse of what was on the minds of these people. The painted, engraved, and carved images of prehistory are threads from past cultures, and we are foreigners trying to interpret their meaning. Perhaps more than anything else, art can be fully understood only in the context of the culture that produced it. 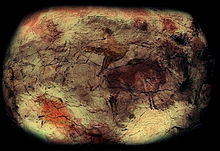 The first major discovery of prehistoric art was the Spanish cave of Altamira, which, like Lascaux, is one of the most spectacular examples of Upper Paleolithic art yet known. The Abbé Breuil died in 1961, and with him died the all-encompassing hunting magic hypothesis. By this time another French archeologist, André Leroi-Gourhan, had been developing his own interpretation, one based on the emerging ideas on structuralism. Where Breuil has seen chaos—or at least, randomness—in wall art, Leroi-Gourhan sought and found order. Leroi-Gourhan surveyed more than sixty caves and saw order in the distribution of their images. Deer... often appeared in entranceways but were uncommon in main chambers. 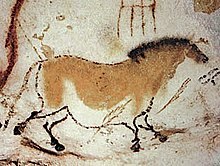 Horse, bison, and ox were the predominant creatures of the main chambers. Carnivores mostly occurred deep in the cave system. The first era of the Upper Paleolithic, the Aurignacian, is notable for several reasons, one of which is the absence of painted caves. ...One of the most evocative pieces from this era, from the Abri Blanchard in southwestern France, is a flute. Music must have been an integral part of Upper Paleolithic life too. Next to the discovery of the Turkana boy, the visit to Lascaux ranks as one of the great moments of my life. Dots are just one example of an element in Lascaux art, and in all cave art... This is a profusion of nonrepresentational, geometric patterns. In addition to dots, there are grids and chevrons, curves and zigzags, and more. ...The coincidence of these geometric motifs with representational images is one of the most puzzling aspects of Upper Paleolithic art. ...images, six different kinds in all, are shimmering, incandescent, mercurial—and powerful. Called entoptic images—which means "within vision"—these phenomena are products of the basic neural architecture of the human brain. People who pass from stage two hallucination to stage three often experience a sensation of a vortex or rotating tunnel around them, and soon have hallucinations filled with iconic images, not just signs. ...It is here that "monsters" appear, part human, part beast, known as therianthropes. The question... is whether Upper Paleolithic art bears the telltale signs of Lewis-Williams' three stage neuropsychological model, and could thus be shamanistic art. Of the range of images in Upper Paleolithic art, the most arresting are the therianthropes. There are not many... but they seize the imagination. The most famous is the so-called sorcerer... In a manner unusual for Upper Paleolithic images, the sorcerer is staring directly out of the wall, a full-face stare that transfixes the spectator. When a San Shaman goes into a trance, he harnesses that power, becomes part of the world beyond, becomes invisible to the singers and dancers around him, and draws images on the rock face. Ask the San who drew the images, and they say the spirits. And the rock face is more than a surface for the paint; it is the boundary of this world and the world beyond. ...part of the meaning of it all, and the rock shelter itself assumes a special status, a place of veneration. 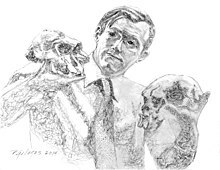 If the Darwinian package were correct, then we would expect to see the simultaneous appearance in the archeological and fossil records of evidence for bipedality, technology and increased brain size. We don't. If the molecular evidence is correct... almost five million years passed between the time our ancestors became bipedal and the time when they started making stone tools. Whatever the evolutionary force that produced a bipedal ape, it was not linked with the ability to make and use tools. However, many anthropologists believe that the advent of technology 2.5 million years ago did coincide with the beginnings of brain expansion. We are justified in calling all species of bipedal ape "human." ...the adaptation of bipedalism was so loaded with evolutionary potential—freeing the upper limbs to be free to become manipulative implements one day—that its importance should be recognized in our nomenclature. These humans were not like us, but without the bipedal adaptation they couldn't have become us. Rather than living as aggregations of families in nomadic bands, as modern hunter-gatherers do, the first humans probably lived like savanna baboons. Natural selection operates according to immediate circumstances and not toward a long-term goal. Homo sapiens did eventually evolve as a descendent of the first humans, but there was nothing inevitable about it. [Fred] Spoor's observations are truly startling, In all species of the genus Homo, the inner ear structure is indistinguishable from that of modern humans. Similarly, in all species of Australopithecus, the semicircular canals look like those of apes. Does this mean that the australopithecines moved about as apes do—that is, quadrupedally? The structure of the pelvis and lower limbs speaks against this conclusion. So does a remarkable discovery my mother made in 1976: a trail of very humanlike footprints made in a layer of volcanic ash some 3.75 million years ago. When our ancestors discovered the trick of consistently producing sharp stone flakes, it constituted a major breakthrough in human prehistory. ...The modest flake... is a highly effective implement for cutting through all but the toughest of hides... the humans who made and used these simple stone flakes thereby availed themselves of a new energy source—animal protein. The French archeologists Iégor Reznikoff and Michael Dauvois conducted detailed surveys of three decorated caves in the Ariège region of southwest France. ...they moved slowly through the caves, stopping repeatedly to test the resonance of each section... spanning three octaves... those areas with highest resonance were also those most likely to harbor a painting or engraving. ...a fascinating discovery that... Chris Scarre commented at the time, draws "new attention to the likely importance of music and singing in the rituals of our early ancestors." The major sites, such as Altamira, are often surrounded by smaller sites within a 10-mile radius, as if they were centers of political or social alliance. Three revolutions mark the history of life on earth. The first was the origin of life itself... The second... was the origin of multicellular organisms... The origin of human consciousness... was the third... Life became aware of itself, and began to transform the world of nature to its own ends. It is impossible to imagine existence in the absence of subjective sensation we call reflective consciousness. The neurobiologist Harry Jerison has made a long study of the trajectory of brain evolution since the advent of life on dry land. ...the origin of new faunal groups is usually accompanied by a jump in the relative size of the brain, known as encephalization. ...the first archaic mammals... were equipped with brains four to five times bigger than the average reptilian brain... primates are twice as encephalized as the average mammal. Within primates, the apes... are some twice the average size. And humans are three times as encephalized as the average ape. Jerison argues that we should think of brains as creating a species' version of reality. ...As brains enlarged through evolutionary time, more channels of sensory information could be handled more completely, and their input integrated more thoroughly. The challenge for individuals in primate societies is to be able to predict the behavior of others. One way would be for individuals to have a huge mental bank in their brains, which stored every possible action of their fellow troop members and their own appropriate actions. In order to be able to deceive intentionally, an animal must have a sense of how its actions appear to another individual. Such an ability requires self-awareness. This tendency to anthropomorphize flows naturally from the context in which consciousness evolved. Consciousness is a social tool for understanding the behavior of others by modelling it on one's own feelings.